Thinking about glamping in France for the first time? Want to ditch the tent poles in favour of a tipi, yurt or treehouse? here's the essential info you need to plan the perfect French escape. In reality, it's nothing new of course. For centuries civilisations across the world have made perfectly comfortable homes out of simple, readily available materials and easily transportable structures. Many of these have become the inspiration for an alternative camping experience in France. In recent years more and more glamping sites have opened their doors to tipis, bell tents, yurts and airstream trailers and Cool Camping have been there to give you all the information you need. You can either browse our collection of the best glamping sites in France now or have a read of our top tips below that will help you decide how to get the most out of your holiday in France. If you can, skip French school holidays when much of France decides to pitch up too. Spring holidays in April and October/November are reasonably quiet, but campsites burst in July and August. The beauty of glamping, of course, is that most sites keep their numbers down anyway so, at busy times, look for the smaller glamping sites with fewer pitches rather than large scale campsites that have glamping as an option alongside regular camping. 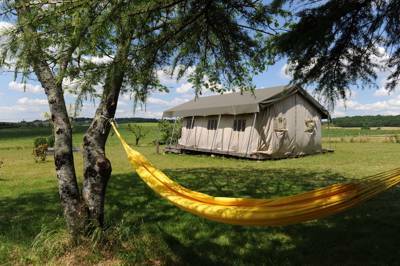 Glamping sites in France generally open from March to September or October. Early booking is always recommended, given the small capacity of most glamping sites they fill up a long time in advance, particularly if you're thinking of glamping in the summer. You can now book sites in France right here on the Cool Camping website (though by no means all of them). In particular, glamping sites on the coast sell up very early, especially those easily accessible from the UK, like glamping in Normandy and Brittany. Okay, so there's no 'right place' in France and, depending on what you're looking for, there are always going to be individual reasons that govern where you choose. But there are still a few useful tips. To ensure a good choice of dates and destinations during the holidays, it is worth considering areas outside of the summer holiday hubs. The Alps are often overlooked, but there are some stunning sites to be found there and plenty of outdoor activities to fill a holiday. Glamping in the mountains has a real 'retreat' feel about it and the small rural villages found there have plenty to offer in terms of 'authenticity' – less influenced by English tourists. Inland is often quieter than on the coast so, even if you want a beach holiday, finding a glamping site a few miles from the coast can sometimes be the answer. It gives you a hideaway from the crowds but still an easy route to the beaches. The main thing, of course, is to decide first what kind of holiday you're after. If you want a complete escape and some back-to-nature alone time, then central France, Burgundy and the Alps are a safe bet, especially the well-hidden woodland glamping sites. These regions are relatively quiet and boast outdoor activities as their key attraction. The Loire, Normandy and Brittany, meanwhile, have heaps of history and plenty of family-friendly attractions for those who'd prefer to have more of an itinerary to keep the kids at bay! The type of accommodation you choose is a matter of personal preference but the climate of France, unlike in the UK, does allow for a wider variety of options. While the UK requires pods, gypsy caravans and shepherd's huts to keep you warm outside of the peak summer season, the French can get away with the thin canvas of a bell tent and you'll still be asking for extra shade to stop you getting too hot! For family holidays, the larger glamping units, like safari tents and yurts, are the most suitable. Safari tents often contain several different rooms, which adds some extra privacy, while yurts have the flexibility of offering couples a generous space or families a cosy, shared environment. Make sure you read the full information on what facilities the glampsite you're visiting has inside its accommodation. The definition of 'glamping' is very broad, with some bell tents featuring a blow-up mattress and sleeping bags, while others have full king-sized beds and cooking facilities – decide what level is right for you and bare in mind how you plan to travel. Flying? Then book a glamping site with all the cooking utensils provided. Travelling by car? Think about how much kit you intend to bring from home. One of the newer and extremely popular options is glamping on a farm in France. Feather Down Farms are the real pioneers of this, setting up safari tents and high-end glamping facilities on farms across the country and then leaving the owners to host you. It means you get tried and tested accommodation and first-rate facilities but also a real cultural insight into the French way of life. The farmer will give you a tour of the land and show you how they create their produce – whether its a small organic mill in the Dordogne or a dairy farm in Normandy – and they also provide luxuries, like onsite pizza ovens or hampers of their home grown produce. These Feather Down Farms stays are often geared more towards family holidays than couples (and the accommodation attests to that) but there are plenty of other options out there too. Try searching for France on our website and then refining your search using the various tabs along the right hand side of the screen – click on 'on the farm' for farm holidays. Metaphorically speaking, France is now nearer than it's ever been before, with the short hop across La Manche (what the French call the English Channel) taking less time than a drive across London. There are many different ways of getting there – and if you're David Walliams you may even want to swim – but for us hopeless romantics at Cool Camping, braving the wild seas by boat, faithful Citroen packed with kit, is the way to go. The Channel Tunnel is now the most popular option in Britain. Around 20 million passengers pass through each year and it takes just 35 minutes to travel from one side to the other. You also pay per car, rather than per person, making it handy for large family trips. Yet, while travelling by car certainly allows you to bring along a lot more gear, the very beauty of glamping is that you can do it all with the minimum of fuss. If you're going to a glampsite that has everything you need, you might choose instead to travel by train or plane. The sleek Eurostar service from London's St-Pancras International is an easy option and often involves less hassle when boarding and departing than going by plane – though flights from the likes of Ryanair and Easyjet mean that flying is now often the cheaper option. Most glamping sites, however, are not particularly accessible by public transport so make sure you know what you're getting yourself into. If you're flying, hire cars are often a must to get the most out of your glamping holiday. However you go, return fares fluctuate hugely depending on how and when you book, what time of year and day you travel, how flexible a ticket you want, if you snag a special offer and so on. A return ferry fare for car and passengers costs anything from £50–£250, as does a return flight or one round trip on the Eurostar. Motoring through the Channel Tunnel can get the mob across for less than £100 return, but – as with ferries – there is still petrol and péages to consider.